Tri-Force is the premier Mixed Martial Arts facility in Rhode Island! Located at 179 Conant St. Pawtucket, Rhode Island in the heart of the historic mill district Tri-Force MMA has been owned and operated by Keith and Peter Jeffrey since 2007. At 15,000 square feet and just minutes from Providence, Tri-Force MMA is Rhode Island's largest Mixed Martial Arts Dojo and training facility. Offering dedicated classes to all aspects of MMA along with the best Strength and Conditioning system on the planet, Training for Warriors! Tri-Force is also an official RCJ Machado Jiu-Jitsu affiliate. We've taken our experience and combined it with guidance from one of the most notorious families in all of BJJ to bring our students the most comprehensive program available. Using a structured curriculum that includes warm ups, solo drills, and partner drills provides the optimum environment for students to learn new techniques and actually retain the knowledge to add to their game plan. RCJ Machado is setting the quality standard in Brazilian Jiu-Jitsu and we're very excited to provide this great opportunity to our students. Champions such as Brennan Ward, Mike "The Beast" Campbell, George "El Conquistador" Rivera, Chuck "Cold Steele" O'Neil, Eric "The Dream Catcher" Spicely, Todd "The Hulk" Chatelle, "Filthy" Tom Lawlor, and Edwin "La Bomba" Rodriguez (WBA Super Middle Weight top 10 contender) have all elevated their training at Tri-Force MMA. As always, we offer a no obligation free trial week of training because we believe in our system, our coaches, and our students. Contact us below to schedule your free week! It is fight night for CES MMA 47 and Greg “Ribz” Rebello (22-8) of Tri-Force MMA and Sityodtong Boston will take center stage as the main even of the evening. Squaring off against Derrick Brown (7-3) of Myrtle Beach, South Carolina, Rebello is prepared and focused on earning his 23rd career win. Professional mixed martial artist Marquis Brewster (3-0) of Tri-Force MMA takes to the cage tonight to continue his fire hot win streak within the CES MMA Bantamweight Division. Learn Brazilian Jiu-Jitsu, boxing, Muay Thai, wrestling and more in a family friendly environment where everyone is welcome! We have classes for all ages and welcome all levels of experience. Everyone is treated as an individual with their own unique path to reaching their goals. Our facility is the largest in Rhode Island and we've got everything you need. Our MMA training center can host over 50 students in a class with room to spare. Our TFW strength and conditioning section is a fully equipped fitness center with indoor turf. A robust martial arts program for kids of all ages. We teach the core values of martial arts along with skills and techniques for Brazilian Jiu-Jitsu, wrestling, and the striking arts. Children are the future and Tri-Force is heavily invested in giving the youth of our area a safe, welcoming environment to learn and grow. Our age groups are 2-6, 7-10, and 11-14. Train with the best, become the best! We strive to provide an environment open to all skill levels that is goal oriented and provides the skills needed for success in combat sports, but also in life. Through practical application students will grow in Brazilian Jiu-Jitsu, Boxing, Muay Thai, Wrestling, and fight conditioning. The greatest lesson that is developed is the permanent strength of the mind and body; with the confidence that will carry you through whatever obstacles life throws at you! Here are some highlights from a few of our recent classes! 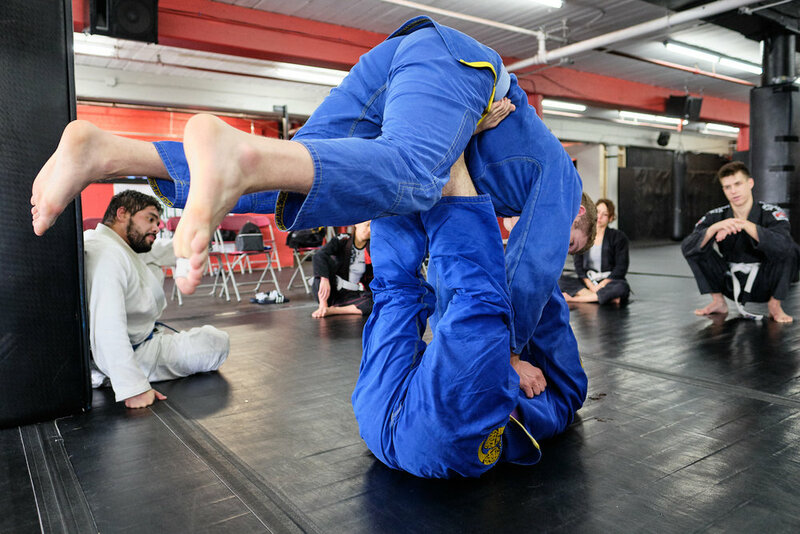 We offer Gi and No Gi Jiu-Jitsu classes for all levels of experience. Whether you're looking for a fun, healthy hobby or you desire to compete at the highest levels we've got you covered. Our head instructors are active in the Jiu-Jitsu community and have studied under Tim Burrill and Carlos Machado to earn their black belts. Our classes include wrestling techniques, traditional takedowns, transitions, sweeps, escapes, and submissions. We spend plenty of time drilling and even more time rolling to get real experience grappling with real grapplers. We have students of all shapes and sizes and welcome anyone willing to learn! We offer single discipline striking sports like Muay Thai and boxing plus we've taken our experience within MMA competition to adapt these two phenomenal striking arts to accommodate for the addition of grappling. We focus on the fundamentals such as balance and proper form, but we also teach advanced footwork and the strategy involved with controlling distance, maintaining composure, and gathering information on the opponent's tendencies. We have students of all ages and abilities. We foster an environment that eliminates ego and allows everyone to learn regardless of their experience. Our kids program focuses on building athleticism, confidence, respect, and accomplishing goals through hard work and dedication. We provide a safe, comfortable environment that allows our students to have fun first and foremost, but also learn the fundamentals of Jiu-Jitsu and MMA. 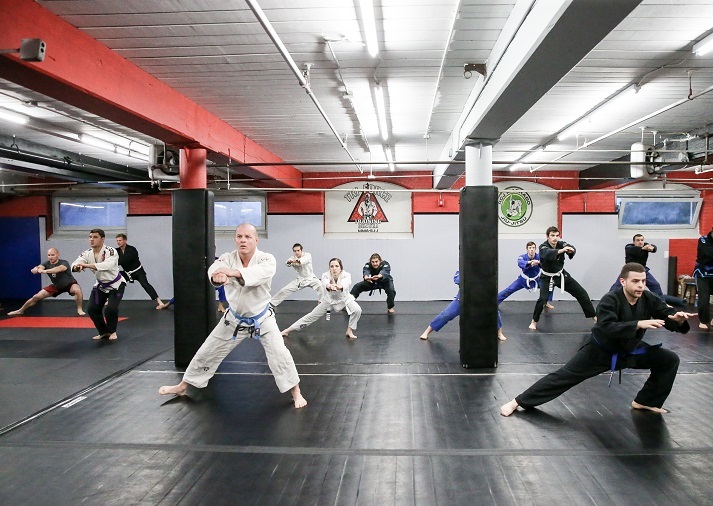 Class typically begins with a warm-up consisting of footwork drills and animal movements followed by small group instruction on specific mixed martial arts techniques. Then we move into games that break the ice for students so that they get an opportunity to utilize the techniques without the fear of anyone getting hurt. We finish with high fives and respect for everyone's performance! We have grouped our kids classes by ages: 3-6, 7-10, and 10-14. We are very proud of the growth of our kids program. We have children from all walks of life participating together in a team based environment where everyone learns from one another. A few of the students from our older group (ages 10-14) compete at local tournaments, although competition is not required at all. Most importantly, we just want kids to see how fun martial arts and exercise can be. We teach the traditional martial arts values such as respect, honor, and discipline, but in a fun environment where children are encouraged to be themselves. We start our classes with dynamic warm-ups consisting of animal movements, stretching, and foot work drills. We often break from drilling technique and play games designed to get kids comfortable with the techniques learned during class. This gets our students moving and having fun without worrying about their performance. We've found this to be a great way to build self confidence in kids that are a bit more shy. Plus, everyone gets in a dose of exercise, including the coaches! There is more pressure on our kids than ever during the time of adolescence. Cyber-bullying, physical bullying, and peer pressure are far too common in our society today. Being martial artists, our older group of students (10-14 years old) are very unique individuals within their own group of friends. They are confident and know when to walk away. They learn that words are not a just cause for anyone to experience physical harm. They are more resilient than the average kid and they stand up for what is right. This reduces the psychological impact of these stresses that children experience in today's society, which leads to a more confident, healthy child that has the tools to handle anything that life throws at them. We're honored to provide a safe place for our young students to learn martial arts and its core values and we hope you'll give us the opportunity to work with your child too. At 15,000 square feet Tri-Force MMA Training Center is Rhode Island's largest Mixed Martial Arts Dojo/Training facility. It is equipped with an MMA cage, heavy bags, top of the line Zebra mats, a fully equipped fitness center, indoor turf, plus locker rooms with showers.